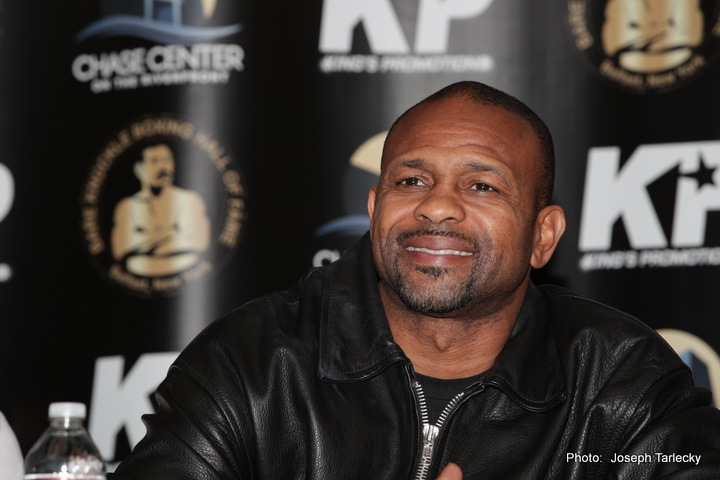 One of the greatest careers in ring history will come to close this Thursday night, when the legendary Roy Jones Junior competes in his final bout as a professional boxer. Widely considered one of the very best pound-for-pound fighters of all time Jones, 65-9 (47KOs), competes in cruiserweight (200lbs) bout vs Scott Sigmon, 30-11-1 (16KOs). The 10-rounder serves as the main event to a five fight Island Fights main card which features both boxing and mixed martial arts bouts. The event will be live-streamed and available on video-on-demand basis exclusively on UFCFIGHTPASS, the UFC’s digital streaming service. Joining combat sport play-by-play veteran TJ De Santis in the commentator booth will be Jeff Lacy. Known as “Left Hook” during his boxing career, Lacy represented the United States at the 2000 Olympics and went on to win the same IBF super-middleweight title Jones had annexed a decade earlier. Lacy also fought Jones in 2009 (the entire fight is available on UFC FIGHT PASS) and will bring a wealth of knowledge to the event. “This is the first live boxing on UFC FIGHT PASS. I love being the first to do something, so to be the first boxing event on UFC FIGHT PASS is cool. When I turned pro back in 1989, I said I wanted to bring new audiences boxing and that’s what I tried to do. By having my last night as a fighter on the UFC’s (streaming service) I’m bringing new eyeballs to boxing and I’m throwing a spotlight on the boxing and MMA fighters who are on the event. “It feels different. I’m emotional even thinking about how I’m going to feel on the day. I’m almost tearing up talking. I’m worried about how I am going to feel all day of the fight. I may be crying all day – but once I am in the ring I’ll have to put those tears away because there’s gonna be a guy in the other corner looking to beat me. Scott Sigmon won’t care about those tears. He cares about getting the win, that’s the reality. “I turned professional in May 1989 in this same arena, but I’ve been doing this since 1979. In 39 years there’s not been a single day where I didn’t put on glove, skip, watch tape or spend time thinking about boxing. “I’m not sad to get older, we all get old. I had a great prime. I was good in my prime, y’know? I wasn’t surprised that I was getting old, and that my abilities were getting more limited. Everybody knows everybody gets old, but I think some guys really don’t think their body will get old. “I accepted it. People told me to retire but I knew what I could do and I’ve never let anyone tell me what to do. “Losing my undefeated record the way I did (on a controversial disqualification five months earlier) was really bad for me. Y’know, even though everybody who ever saw that thought it was wrong, my undefeated record was still gone. Done. They took my “and 0” away and there was no getting it back. So the second fight came and I made sure to prove who was the better fighter. “I wanted to be a world champion my whole life but I never once thought of the heavyweight title until it presented itself. This was something that God gave me, way and above more than I ever asked for or expected. It was the chance to make history, to do something nobody would dream of me doing. “The great thing today is it don’t matter what anyone says or what anyone writes, you can type “sickest boxing highlights” into YouTube or Google and you see Roy Jones Junior doing this thing. Nobody can change your mind after you see that. That is pound-for-pound! I did what I did – it happened – it is a fact. “Nobody else comes close. You can watch me side-by-side with anyone and it’s not close. “Floyd Mayweather was TBE (The Best Ever) at making money, but look at his highlights and look at mine. You can’t pretend it’s the same. You can’t pretend there’s ever been anyone come close to doing what I did. Nobody you could name could touch me – and I’m talking about nobody who’s around now, nobody who was around in my prime, and nobody who was around any time you can mention outta your mouth. “In my prime, I was the ruler. Simple as that. “I understand there’s a lot of great fighters who’ve followed me already since I was the champ – and I hope there’s another who comes along does even better because want to see that – but I haven’t seen anyone do what I did yet. I haven’t seen anyone turn pro at 154lbs and win the heavyweight championship of the world. “Even the great Sugar Ray Robinson, the pound-for-pound guy that he was, couldn’t win the light heavyweight title after turning pro as a welterweight. He had a difficult time trying that. So that tells you how hard it is to jump up that kind of weight and win. In addition to the historic Jones bout, the Island Fights 46 event features German boxing sensation Ikram Kerwat, who has five knockouts in her eight professional wins, plus 25-year-old prodigy Mike Davis. A former New York State wrestling champion and BJJ purple belt under Marcelo Garcia, Davis has a combined combat sport record – MMA and boxing – of 22 fights, 22 wins and 22 stoppages. He fights Montrel James in a MMA lightweight fight. The event marks the first time UFC FIGHT PASS has added boxing to its live fight offering. FIGHT PASS already live streams weekly action from UFC, MMA organizations from around the world, kickboxing, Muay Thai and submission grappling. Plus subscribers have VOD access to over 16,000 historical fights from 37 promotions, Original content, documentaries and the UFC’s TV archive. For more information, please visit UFCFightPass.com.